a book chick: "The Good Luck of Right Now"
my take: I watched The Silver Linings Playbook several months ago and was stunned by it ... wild, gripping, poignant, disturbing, redemptive ... and then we watched the additional material at the end and wah! 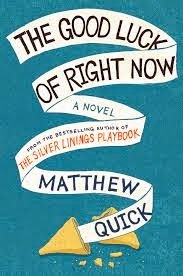 it was a novel (first) by Matthew Quick...so when this came out as the pick of the month, I knew I needed to read it. Daughter and Hubby got to read it before me and I got good vibes from them. I finally got my hands on it and read it in a couple days ... it's so good. The entire book is letters written to Richard Gere, so a watching of An Officer and a Gentleman and perhaps Pretty Woman will get you visually ready. Like Silver Linings (at least what I can gather from the movie), the characters will grab your heart and pull you into their madness. I gotta wonder if Richard Gere has read it ... This will make a great movie, IMHO. My source was my bookstore lady... but I was glad the Costco lady recommended to you so I could get my mitts on your copy. This is the first one I enthusiastically offer up right now whenever someone asks me what good books I've read lately. Loved it. And I would love to know if Richard Gere ever reads and enjoys too.